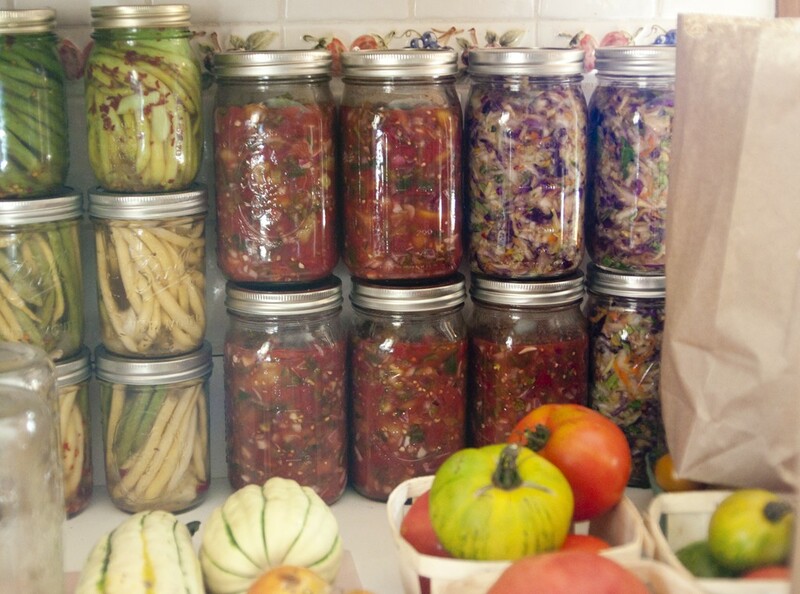 Harvest ferments: dilly beans, salsa, kimchi-kraut, oh my! I'm inclined to deny autumn an early start. But as peak produce season shifts into foggy nights and cool, dewy mornings, I've been processing summer vegetables with undeniable urgency. In the last week, I've canned tomatoes and kimchi-kraut, and partnered with friends and neighbors to squirrel away dilly beans and salsa, too. On Sunday, a girlfriend and I made this spicy, fresh-flavored pico de gallo, using garden tomatoes and garlic, plus poblanos and onions that I grabbed from Putting Down Roots Farm at Chelsea farmers market last Friday. It's fab the moment you make it, so ladle some off and enjoy it right away. But given a few days to develop, the salsa's flavor deepens to a tart, extra-spicy (and extra-healthy, probiotic) mélange. For folks who are new to making their own fermented foods, this is a really nice newbie recipe. Unlike kimchi or even sauerkraut, it's a snap to make, and the resulting salsa is familiar and accessible to every palate. Once you've fermented it at room temperature for several days, stick it in the fridge. It'll last about a month, for continued summer-y enjoyment, even after the first frost. Start with sterile canning jars and lids — I like to boil the lids while I prep the vegetables so they go straight from the hot water to the can. Combine all ingredients in a large pot or mixing bowl. Stir well and allow to marinate 10-15 minutes, until the veggies release enough liquid to submerge themselves. Ladle the salsa into the jars. Screw on the lids and place on a visible kitchen surface to ferment 2-5 days. Check the jars daily and crack the lids to release pressure as needed. Taste after the second day, then daily thereafter. When the salsa reaches your desired level of tartness, store in the fridge for up to one month. *Use a mix of meaty "paste tomatoes" such as Roma or San Marzano, plus some juicy slicer types, like beefsteak or Brandywine. I also used a few green tomatoes that had dropped off of my plants. Got Beer? Marinate Wild Mushrooms!